Obama held a press conference Thursday, primarily to discuss the BP oil leak. Despite talks of conducting monthly press conferences back when he was running for president, today's conference was his first full-blown news conference in 308 days. Obama answered questions regarding the policy and politics of the ongoing oil spill in the Gulf Coast. He explained that there was little to no regulatory control on the part of the government prior to the explosion, and according to AllVoices.com said, "There has been a 'scandalous' relationship between oil industry and regulators." Obama explained that BP will be held accountable on behalf of the United States and all those affected by the oil leak. 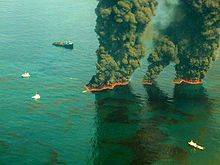 A team of 20,000 scientists and experts from around the world are working on the oil spill around the clock. Furthermore, there has been suspension of Alaskan and Gulf Coast exploration as well as drilling off the coast of Virginia. It was also announced today that Elizabeth Birnbaum, the director of the U.S. Minerals Management Service (MMS), resigned after receiving pressure from White House officials. The Minerals Management Service has been faulted for lax oversight in the wake of the mammoth spill. Some lawmakers said Birnbaum's ouster, while welcomed, did not go far enough. "As has been exhaustively documented, the problems at MMS aren't just limited to them but also extend to their relationship with the Department of Interior. We are seeing the result of a broken bureaucracy with a dysfunctional culture that is in desperate need of substantial and immediate reform." Click here to read New York Times' live blog from the press conference.